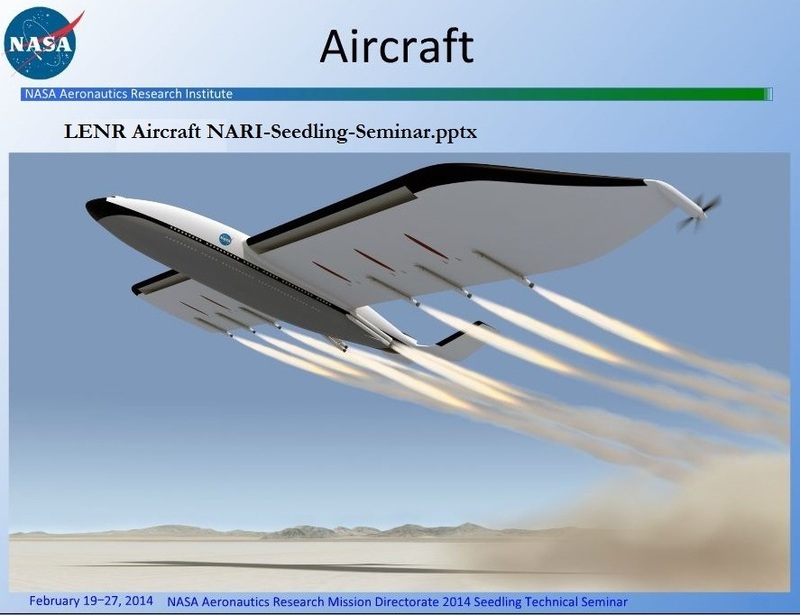 NASA Aeronautics Research Institute is currently showcasing some of their innovative concepts developed by NASA researchers, primarily featuring work from the Seedling Phase 2 and Seedling Phase 1. One of the concepts featured in a live video stream session today was the LENR Aircraft. Below is a short summary of the talk. Small, Runway Independent Transport with high power to weight ratio. Personal aircraft or autonomous package delivery. Disruptive change to transportation business model. Global flight range of 12,500 miles. No clear model of how LENR systems will scale. Robust methods for energy management and dissipation are required. Underlying physics not yet fully understood. Methods for converting heat to thrust have to be formulated. No Mechanism for throttle and adjusting desired power levels. Continue to intergrate the latest LENR research and testing results. Move on to Phase II. Refine existing propulsion and aircraft concepts. This entry was posted in Uncategorized and tagged Aeronautics Research Institute, LENR, NASA. Bookmark the permalink. Sugar Volt will show you phase four quicker than we knew about phase one… which was years after initiation by NASA with Boeing and GE. Every challenge has been identified and overcome by NASA in previously demonstrated breakthroughs, none are consequential enough to be truly problematic, red herrings at the most. —every indication is that LENR is easily scaleable – period. ——- NASA has been there and done that – period. Go out there in space and fry your tush while frostbiting your delicate front. This will have you screaming achnowlegement of NASA expertise in robust methods for energy management and dissipation, while asking for a quality space suit. ————Oh yeah. That just says you do not know something because you do not know it yet. — Excuse me… Rankin? Carnot? Horsepower? MPG? Haven’t you been you using heat for your thrust? Or to spin you local turbine without wind or water? No Mechanism for throttle and adjusting desired power levels. Let’s look at that one. Thrust is never a problem for electric, which requires no transmission (gearbox) for maximum tourque through all power ranges of applied rpm. Thrust, power levels, and throttle adjustment are finely controlled through current management, Such is the beauty of Mag-Lev and also electric wind tunnels. Hey all trains supply of tourque is electric also every bit of tourque required for the Queen Mary – Supplied by GE underwater thrusters. Absolutely no driveshafts, transmissions, or differentials in any of these systems, hence beauty in simplicity. Greg, so basically your solution is electricity production. But it takes electricity to produce electricity from LENR, reducing the overall efficiency if current conventional production methods are used. The fastest manmade crafts are the NASA deep space probes. Heat to thrust (no tourque with this puppy) supplied by refined U238 pellets, converted to electricity by thermoelectic films, powering ion plasma spacedrive engines. Yes, robust methods for energy management and dissipation are required. A number of things coincide. Peizo-thermal electric conversion attains 40% efficiency… no steam cycle required. Graphene supercapacitors double as structural frame members… exponential storage capacity… miniscule charging time. What is that spewing out the tailpipes, CHEMTRAILS? Hmm? Sure looks like it to me.